ATLANTA The wife of former Atlanta Braves star Andruw Jones accused him of dragging her down a staircase, grabbing her neck and saying wanted to kill her, according to police records. A police report obtained by The Associated Press said the fight happened around 1:30 a.m. on Christmas Day, after Nicole Jones asked her husband to help her prepare their suburban Atlanta home for Christmas morning. Andruw Jones was free on bond after his arrest on a battery charge, according to Gwinnett County Jail records. It wasn't known Wednesday whether he has an attorney. Nicole Jones told officers that she tried to escape upstairs, but her husband grabbed her by the ankle and dragged her down some stairs, got on top of her and said, "I want to kill you," according to the report. 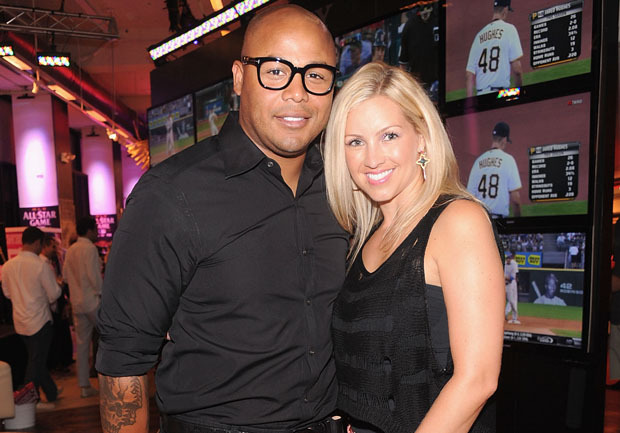 "Due to Andruw's level of intoxication, Nicole said that she was able to push him back and move away from him," the report states. Nicole Jones then went to her parents' house. When officers arrived at the Jones residence in the Sugarloaf Country Club in Duluth, they said he appeared confused about what had happened. "We entered into the bedroom and announced `Gwinnett County police,"' an officer wrote in the report. "Andruw did not respond and it appeared as though he was passed out in his clothes," the officer wrote. "I touched Andruw on the arm and said `Gwinnett County police, Andruw, we need to speak with you.' Andruw woke up and appeared dazed. He appeared heavily intoxicated and confused about why officers were standing in his bedroom." Recently, Jones, who has 434 home runs and 10 Gold Gloves to his credit, signed a contract to play in Japan next season, according to CBSSports.com.